Monday 9th March 2015 is Commonwealth Day – the day when all 22 of Norfolk’s Town Councils together with the County’s eight Local Authorities will raise the Commonwealth Flag in unison at 10.00 am. In 2014, Norfolk was the first county to involve all its eight Local Authorities in this Commonwealth Day celebration. This year, Norfolk again leads the way through the participation of all of the Town Councils being involved as well. This has been made possible through the generous support of Nwes, who are sponsoring the Commonwealth flags. 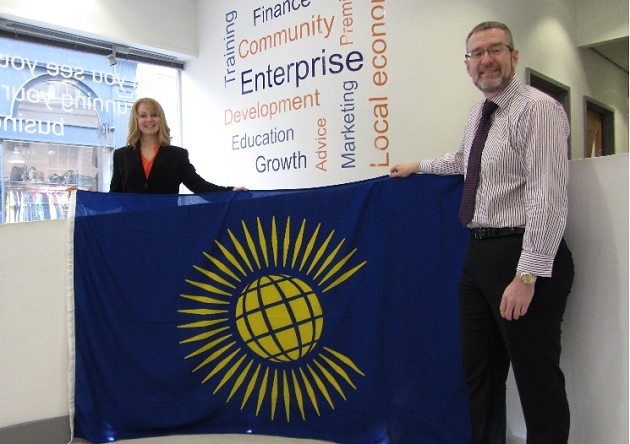 This year over 650 Commonwealth Flags will be raised in total. This unique initiative enables local communities to become involved and join with other communities across the world, in a widespread expression of commitment to the Commonwealth. Participation around the globe has grown following the highly successful events of last year. The ‘Fly a Flag’ initiative brings to the forefront the Commonwealth, reminding everyone of the opportunities offered to its citizens, and the values it stands for. A ‘Commonwealth Affirmation’ specially written for the occasion, will be read out at each ceremony before the raising of the Commonwealth Flag, together with the playing of the official Anthem of the Commonwealth. Fields of Life, a charity based in Northern Ireland and Uganda, will mark the day by taking the Commonwealth Flags to the top of the UK’s four highest National Peaks: Scafell Pike in England, Mount Snowdon in Wales, Ben Nevis in Scotland, and Slieve Donard in Northern Ireland. In Uganda, the charity will be raising the flags at schools across the country. P&O and Cunard Line will be raising Commonwealth Flags on board their ships as they cruise around the world on the day – an historic maritime first. Other locations of special significance where the Commonwealth Flag will be raised include George Cross Island, Malta; the City of Wellington, New Zealand; Lowestoft, Suffolk, (as the most easterly town in England); Unst in the Shetland Islands (the most northerly inhabited Island in the UK); the Rothera Research Station on the Antarctic Peninsula; and Tristan Da Cunha, the remotest inhabited Island in the world – to name but a few. The sun rises first on 9th March over the Kingdom of Tonga. At 10.00 am Tonga is where the first flag will be raised. Halaevalu Mangisi Palu, Chief Commissioner the Girl Guides Association of the Kingdom of Tonga (GGAKT), said, “In Tonga where time begins,GGAKT are proud and delighted to be the first in the world to raise their Commonwealth flag at 10.00hrs on Monday 9th March 2015. We will be leading the youth of the Commonwealth in this unique, historic, global event that morning, are we are indeed very happy and look forward to the day. We are determined with the youth of Tonga to enjoy our involvement in support of the Commonwealth Charter, to which we owe a great deal”. His Excellency Kamalesh Sharma, Secretary-General of the Commonwealth said, “Fly a Flag for the Commonwealth is a most imaginative way for people in local communities – wherever they live, learn or work – to join together with others throughout the Commonwealth in a spirit of respect and understanding to celebrate the variety of unmatched diversity of our global family. I welcome and commend it.